Many liquors get unfairly judged as harsh or bitter. But many are created with sweeter flavors in mind, meant to complement desserts or offer a pleasant break from other more robust flavors. Wow your friends with a collection of liquors that will introduce them to sweeter cocktails. 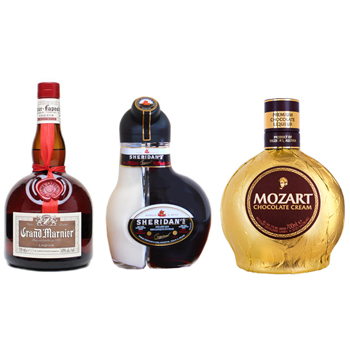 Your recipient will receive a whimsical bottle of Sheridan's filled with two complimenting liquors (0.5 L), a bottle of decadent Mozart Chocolate Cream (0.5 L), and a bottle of Grand Marnier Cordon Rouge (0.5 L) with citrus notes. Say Happy Birthday, welcome them home, or spoil your best friend with A Mix Of Flavors Sweet Tooth Liquor Set.